Results: Whether inside a solar panel or the human body, reactions occur where liquids and vapors meet. While the location of the reactions is well known, the details are not. 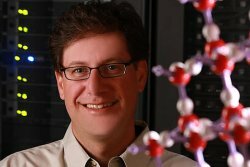 Scientists from Pacific Northwest National Laboratory and their collaborators completed three studies of interfacial reactions using leadership-class computers that provided previously elusive details about the reaction processes. This work was made possible by a 2008-2010 Department of Energy Innovative and Novel Computational Impact on Theory and Experiment (INCITE) award. Why It Matters: Understanding how to control interfaces is one more step toward controlling complex chemical processes, such as transforming solar power into chemical fuels. Modeling these reactions requires a detailed knowledge of the behavior of electrons, atoms, and molecules inside complex chemical systems. One example is systems that could be a new form of solar cell, designed to harness sunlight. Using supercomputers at Argonne National Laboratory (ANL) and Oak Ridge National Laboratory (ORNL), the team developed insights that shed new light on a host of experimental results. "The challenge is that experiments of liquid/vapor interfaces are very difficult to interpret," said Dr. Christopher Mundy of Pacific Northwest National Laboratory, principal investigator on a series of liquid/air interfaces studies. "Our goal is to provide sound theoretical benchmarks to aid in the interpretation of experimental results." Methods: Funded by the INCITE award, the team published three research papers. "Toward an Understanding of Complex Chemical Systems," SciDAC Review. This 12-page paper highlights computational chemical physics in interfacial reactions and describes results from several studies. For example, combining experimental data and supercomputing power, the team elucidated the structure of rhodium clusters. Experimental data had pinpointed the clusters as the active agents in stripping hydrogen off aminoborane, but the arrangement of each cluster's 100 atoms was unknown until the team's study. The SciDAC Review article also highlights other INCITE studies and covers foundational information on models and the efficacy of a modeling tool known as CP2K. The authors highlight a realistic model of a key interface in dye-sensitized solar cells, which graces the cover. Using the model, they can accurately predict the level of electrons across the system. This prediction is needed to understand and control the efficacy of moving electrons across the interface to their destination. "Hydroxide Anion at the Air-Water Interface," Chemical Physics Letters. The team discovered that the hydroxide anions have a slight affinity for the surface. The team reached this conclusion by modeling and studying a slab of 216 water molecules. The slab provided them with the opportunity to study two interfaces between water and air. The team's results are in direct contrast to empirical models, which predict the anions are kicked away from the surface. This research may help resolve a long-term question as to whether water's surface is charged. The answer to this question influences controlling interfacial reactions. "Interpreting Vibrational Sum-frequency Spectra of Sulfur Dioxide at the Air/Water Interface: A Comprehensive Molecular Dynamics Study," Journal of Physical Chemistry B. In this study, researchers determined the structure of sulfur dioxide and water on the surface. The structure of these complexes has been in contention for some time. The team found that sulfur dioxide molecules push toward the surface, displacing water molecules. This research was an international collaboration involving Mundy, who brought INCITE resources and knowledge to the problem, and scientists from Ruhr-University at Bochum in Germany, PNNL, University of Wisconsin at Parkside, and California State University. What's next? Taking off from the paper in SciDAC Review, the team is investigating complex chemistries, specifically, the fundamental migration of charge, kinetics and associated processes, which occur in at the interfaces of catalysts. Acknowledgments: This work was made possible through resources afforded by DOE's INCITE award. These resources were the Cray XT4 and XT5 at ORNL and the IBM Blue Gene/P at ANL. Additional computing resources at EMSL and Lawrence Livermore National Laboratory (LLNL) were used on different studies. All three studies received funding from the DOE BES Chemical Sciences, Geosciences, and Biosciences Division. The study of hydroxide anions was also funded by the National Science Foundation, a summer research initiative and the Cahill research fund at University of North Carolina Wilmington, and LLNL. References: Christopher Mundy, Shawn Kathmann, Roger Rousseau, Greg Schenter, Joost VandeVondele, and Jureg Hutter. 2010. "Toward an Understanding of Complex Chemical Systems." SciDAC Review, Number 17, pp. 10-21. Cover. Christopher Mundy, I-Feng Kuo, Mark Tuckerman, Hee-Seung Lee, and Douglas Tobias. 2009. "Hydroxide Anion at the Air-Water Interface." Chemical Physics Letters 481(1-3):2-8.